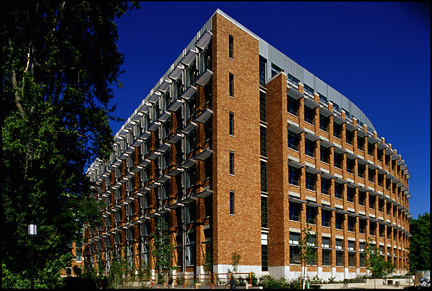 The Allen School maintains a wide variety of state-of-the-art computing facilities for research and instructional use, housed in the Paul G. Allen Center for Computer Science & Engineering, which features three times the laboratory space of the prior facility. The Computer Science Laboratory coordinates the acquisition, maintenance, and operation of the computing equipment and network services. General-purpose research computing is provided by over 900 Windows and Unix-based workstations and servers, located in laboratories, machine rooms and offices. The back-end infrastructure is comprised of general-purpose compute, file, web, mail and print servers, operating as a well-integrated Linux and Windows 7 environment. In addition, around a dozen compute clusters are used by a range of research projects. Allen School networking utilizes 1 and 10 gigabit Ethernet connections to servers and desktop machines, and a dual-band wireless network provides 802.11b/g/n connectivity throughout the building and in surrounding exterior areas. Several large display screens provide high-definition video display research projects and for video conferencing. In January 2019 we are expecting the completion of a new, complementing CSE building that will be located next to the existing Paul G Allen Center. The new 130,000 square-foot building is designed to enhance the undergraduate student experience and enable the Paul G. Allen School to expand research and remain at the forefront of our field. Research in computer systems (including architecture, networking, operating systems, and distributed systems) involves a wide and constantly updated variety of hardware, software, and networks. Current hardware includes high-performance Intel multicore platforms, a 200-node Intel cluster with several tens of terabytes of networked storage, a networking testbed cluster, and PC workstations. Our facilities include Linux, FreeBSD, and Windows systems, and our clusters enjoy 1 and 10 gigabit switched Ethernet connectivity. In addition, the Systems lab provides a common workspace for operating systems, networking, and architecture students, and features Windows workstations, a video projector, and floor-to-ceiling whiteboards. Research in digital hardware and ubiquitous systems is supported by a set of PC workstations and multiprocessor compute servers. A large collection of both commercial and university computer-aided design tools form the core of the design environment providing capabilities for the design of FPGA and microprocessor-based systems, and printed-circuit boards. A variety of specialized equipment for the prototyping, debugging, and testing of microelectronic systems is also available and is housed within the Hardware and Embedded Systems Research Laboratory. These resources are utilized by research projects involved in the design of configurable computing architectures, devices to support ubiquitous and invisible computing, embedded systems, neurally-inspired computing and learning devices. .
Research in graphics, image processing, and user interfaces, centered in the Graphics and Imaging Laboratories, utilizes a set of high-end graphics workstations, two multiple-node compute clusters with GPU processing, and a variety of special-purpose devices, including Microsoft Kinect and Leap Motion controllers, Oculus Rift VR hardware, digital cameras (still and video), a desktop Cyberware 3D laser scanner, video projectors for shape capture, and rotational and translational motion control platforms. Most of the lighting and imaging hardware resides in a special-purpose scanning and imaging laboratory, which is ideal for experiments that require controlled illumination. The main lab spaces contain an array of workstations and an audio/video hardware suite with non-linear digital video editing capabilities. The workstations in the main labs are also used as development stations for experimental teaching software in graphics and vision. Research in Robotics is carried out across five laboratories: Robotics and State Estimation, Sensor Systems, Neural Systems, Movement Control and Human-Centered Robotics. 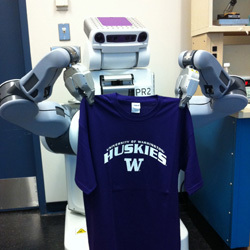 A diverse range of robotic platforms are available in these laboratories, including state-of-the-art research platforms such as PR2 (Hobbes and Rosie), Baxter, Nao, TurtleBot, Darwin-OP, and Fujitsu HOAP-3; as well as custom platforms built in-house, such as Gambit, Marvin, and Adroid. All robots utilize wireless networking to communicate with each other and the lab PCs running Linux. Two labs are equipped with motion capture systems for real-time tracking of objects and humans around the robots. The new CSE2 building will include a new 3,000 square foot robotics lab to allow for expansion and seamless collaboration in the robotics groups. Research in artificial intelligence, data mining, and satisfiability/experimental algorithms is supported by an intensive compute server, a Beowulf cluster composed of 37 dual processor nodes with gigabit Ethernet interconnect. All processors are high-end Pentium 4 Xeon processors, the total memory of the nodes is 216GB, and the cluster has a total of 9.6 TB of disk space. A second cluster consisting of 21 dual-processor nodes, with 84gb of memory and 5.3 TB of disk space supports AI research. Research in data management is supported by a combination of laptops, desktops, and a machine-cluster all running a suite of software systems. The current hardware configuration for the cluster includes over 30 high-performance, Intel mulitcore servers with several jtens of terabytes of storage and hundreds of gigabytes of RAM in total. The machines are configured with either Windows or Linux and run several state-of-the art database management systems including SQL Server, Spark, Hadoop, and Myria.. In addition, the Database lab provides a common workspace for students, and features Windows and Linux workstations, a video projector, and floor-to-ceiling whiteboards. Many other research groups utilize equipment located in a set of research laboratories, that utilize more than twenty compute clusters with a total of around 2400 cores. Additional information can be found in the web pages for individual research projects, at cs.washington.edu/research. Instructional computing is provided through laboratories and back-end services operated within the Allen School. These include three general use laboratories with 75 Intel-based PCs running Windows 7 and Linux. Additional back-end resources are provided by Intel-based compute, web, database, and file servers, in an integrated Linux/Windows infrastructure. The Allen School also operates four special-purpose laboratories containing approximately 80PCs. To support digital system design courses, the Baxter Computer Engineering Laboratory and the Embedded Systems Project Laboratory, with over fifty Pentium workstations for design entry and simulation along with Tektronix logic analyzers, digital oscilloscopes and other test equipment. Capstone courses utilize the Capstone Computing Lab, containing 11 Intel quad-core workstations, and often specialized equipment to fit the needs of the course. The Animation Lab includes more than two dozen workstations, digital video production equipment, and a 3D printer, and is used for teaching interdisciplinary courses in computer animation. The Special Projects Lab contains 20 Intel quad-core workstations, and is used to teach capstone courses in operating systems and other courses requiring specialized equipment or dedicated access. The SPL runs different systems and software at different times, depending on course needs.